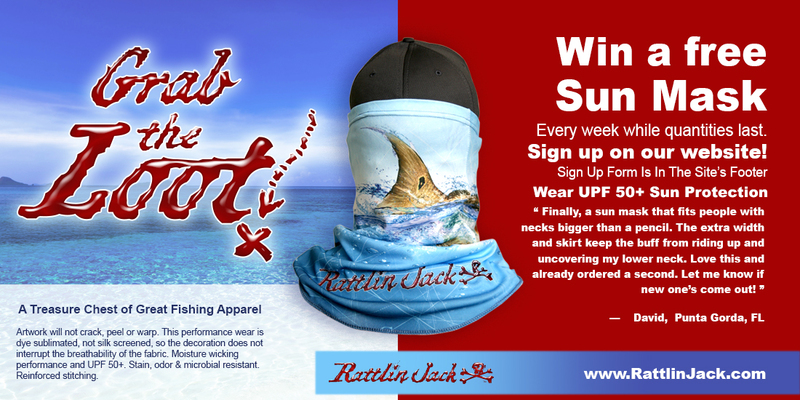 Sign Up For Updates From Rattlin Jack Today! and double stitched. Durable comfort and protection from Rattlin Jack®. One time15% off our regularly priced Rattlin Jack branded products on RattlinJack.com. A chance to win weekly give aways. Emailed information on specials and seasonal deals. Information on new products or special pricing as they become available. Sign up not required for purchase of products, and guest check out is always available. First Name, Last Name, and Email are required for sign up. Your first and last name and email will not be shared with anyone. No partners or associated companies will contact you. Send us an inquiry about your club, group, team, tournament or staff that requires custom UPF fishing shirts. Specials and seasonal deals on bundles that are not available to other buyers. Information on new customizable products or special pricing as they become available. Your information and email will not be shared with anyone. Fishing Apparel that is as tough as you are. UPF 50, quick drying, moisture wicking, and double stitched. Durable comfort and protection from Rattlin Jack. Sign up for our emails with deals and discounts and be automatically entered to win a free Sun Mask every Sunday! (see footer below). It arrived as earlier than promised and the fit is perfect. The shirt itself is higher quality than I expected. I can’t wait to go get it wet. Everything was back is perfectly arrived very promptly and was the exact thing that I ordered perfect size everything thank you very much! Aloha from Maui. Can’t wait to wear it on vacation!! Since being diagnosed with Melanoma skin cancer UPF has become a huge concern in my house. This adds a level of protection that sunscreen cannot, especially since we camp all summer and are outside a lot! WOW! My boys loved the shirts! The graphics were wonderful and very detailed. They have both asked for more shirts from Rattlin Jack for their birthdays. Daughter-in-law wants one too. We just ordered another one as well. we found our new fishing shirts! Thanks so much. Finally, a sun mask that fits people with necks bigger than a pencil. The extra width and skirt keep the buff from riding up and uncovering my lower neck. Love this and already ordered a second. Let me know if the new ones come out! Sure wish Rattlin Jack would make more designs. I’d be glad to help them make them. This shirt is exactly what they say it is! Fish blood, tobacco stains, it all comes out of a white shirt, every time. These shirts are great. My spouse and I both love them, great weight and vivid design. We wear a lot of sun shirts running a fishing charter business, and these are our new favorites. They went through the wash well also…no issues. I did need to contact seller with a question on the product and they replied quickly. Great customer service. Thank you, We will definitely order from them again. I have tried three similar shirts Under Armor Columbia and Nike For the money Rattlin Jack was my choice and terrific response time was leaving on a long sailing trip and never expected they would arrive before I left but they did! Amazing design… So real life and I get so many people that walk up to me and ask where did you get that awesome shirt!!! I just love it and I am ordering the other designs. Redfish Sun Mask – Five Out Of Five Stars! Tarpon Taupe Sun Mask – Five Out Of Five Stars! My husband loved it! He really liked that it opens up at the neck, and is not too restrictive.